As a result of the fascination the unmuted decay of the piano sound held for me, the fading string vibration became the focus of "ab tasten". In each sound of this piece at least one tone fades away unmuted. I also decided to take a given fact (the different fading times: the higher a tone, the shorter it sounds) to form the basis of the music’s temporal organisation. The respective unmuted string determines the overall duration of the sound and as a result, the timing of the composed "muting activities". Having each sound followed by a pause of possibly equal weight is a formal concept I have used in many of my compositions since1995. Each sound stands alone, is a "piece" of music in its own right, an autonomous "image", an individual, that may be perceived in its entire appearance from sounding to dying away. The order of the sounds may be chosen by the musicians themselves. In "ab tasten" I discovered my interest for the moment the sound falls silent, dies away. I noticed, that at some point it is not longer possible to asses whether the strings are still vibrating audibly, or whether it is only the image of the sound which is still in the mind. A sound has a beginning, an existence and an end. These parts, though, cannot be clearly divided: we cannot really say where the beginning is, where beginning turns into continuity, where continuity becomes an ending, where the end is. In "three pianos drumming" from 1999, which I wrote for PianoInsideOut (Reinhold Friedl, Michael Iber, Yunkyung Lee), on the other hand, the piano is used only as a percussion instrument. In three of the Steinway D grand pianos of Sender Freies Berlin the same bass string was taped with adhesive tape, strongly and lastingly muting the string. 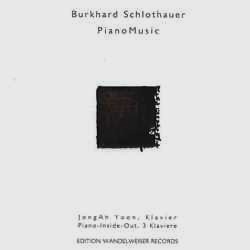 By this treatment the hammer beating of the piano becomes clearly audible. The piano is treated as what it is in terms of its sound production: as a "hammering machine". Hearing recordings of still existing hunter and gatherer cultures, I kept hearing rhythms which were pure pulse. These musics – no matter from which region of the earth – refrain from any conscious accentuation or division of rhythmic units. To me, this seemed to be an archetype of rhythm, some sort of nucleus to every rhythmic music, in which the hypnotic power of these first man made time forms makes itself felt. In "three pianos drumming" the performers determine a set of parameters (dynamics, tempo, pitch) within a given range and stick to these for the entire piece. Each part has its own sequence of beats and pauses, allowing for the emergence of very subtle spaces and microrhythms between the pianos. What fascinates me about this piece (and also its successor, "drumming for one to many percussionists"), is that it remains the same piece, regardless of whether it is played pianissimo or forte, no matter which tempo between 30 and 120 b.p.m is used. or what order of pages the players select. Different versions take on very different "expressive qualities". To me, it seemed very important for my development to have composed a piece which allows for a strong expressive power, without me as a composer having provided it with expression.